Geographically speaking, Russia’s second division Football National League (FNL) is the largest in the world. It outsizes the Russian Premier League due in part to mainstay sides in Kaliningrad, the furthest western point of Russia (Baltika have been at this level for all but two seasons since 1999), and in the Far East (SKA Energiya Khabarovsk have been here since 2002). In addition, invariably, there are sides in the division from Russia’s southern regions and from along the length of Siberia, which stretches the FNL almost to the limits of the Russian map. Russia’s second division probably shouldn’t be such a big league, however: The vast distances needed to travel to away fixtures, strain club budgets to their limits, and almost every season sides are disbanded or refuse their league place due to financial problems. This season Torpedo Moscow should have been in the FNL following Premier League relegation, but club owners decided they didn’t have sufficient resources. Last week players at another former top flight side, Volga Nizhniy Novgorod, protested delays in wage payments by standing still for the first seconds of their match against Tom’ Tomsk. There is hope for change, however. Former football manager Valeriy Gazzaev has presented plans to revitalize Russian football at all levels. Noting that Russia has far more professional teams than almost any other European country, he has proposed that the third tier become an amateur league, and that the FNL be split across three regions: West, Centre and East. Gazzaev is erudite and convincing (some details of the proposal are available here in English), and it is difficult to disagree with him when he notes that “it is better to organise a high quality performance for 54 professional teams [including the Premier League, which is outside the scope of this piece], than to struggle to maintain the survival of over 100.” Gazzaev also points out that a restructured regional FNL could be a more inclusive affair that stretches out to more regions, and therefore may encourage the further development of football in the Urals, Siberia and the Far East—regions where currently there are few professional teams. Gazzaev’s proposal is exactly what is needed—my only question is whether the West-Centre-East regional split is the best one, given the large number of teams close to Russia’s western borders. Let us test it out by supposing that Gazzaev’s proposals are brought into effect for next season; we can use league positions at the time of writing (16 October) to imagine how the new FNL would look. I have assumed that all sides finish in exactly the same places as they are currently, and that teams in the FNL play-off positions for promotion to the Premier League lose their ties. To increase the FNL numbers to 36 (three leagues of twelve, as proposed by Gazzaev), I have added the leading sides from the third tier PFL. The proposals make for a compact West division—the largest distances between teams (as the crow flies) is just over 1700km, which is roughly the distance between Afipsky in Russia’s south and Kaliningrad, Tosno or Saint Petersburg in the northwest corner of the country. 1700km might sound like a lot, but Baltika Kaliningrad’s longest away trip at present (to Vladivostok) is around 7300km. The Centre division is even more compact—a long trip would be around the 1400km between Naberezhny Chelny in Tatarstan and southern sides Anzhi Makhachkala or Torpedo Armavir. But in Russia’s south we stumble across another issue—the large number of teams in the region. We have already placed Afips Afipsky into the West division, but—if we strictly adhere to lines of longitude when placing sides into the right division—near neighbours Armavir are in the Centre division by virtue of being the thirteenth most westerly side. Armavir could be placed into division West to avoid being separated from neighbours just 170km away, but that only shifts the problem to another region—most likely the area around Moscow, where there is also a high density of teams—or to another season as teams from Novorossisk, Vladikavkaz and Sochi push for promotion in the coming years. From what we know of it so far, Gazzaev’s model would seem to mean splitting up one of Russia’s two areas where sides are most densely compacted. To make an East division of twelve sides, teams west of the Urals have had to be included. This would leave Far East sides Sakhalin, Luch Energiya and SKA Energiya facing trips of around 5500km to fulfill fixtures in Ufa and Izhevsk. This would be a reduction in the current travel times—and of course sides in the east would face long away trips however the divisions were split—but the situation could get worse given the scarcity of teams from the Urals eastwards. 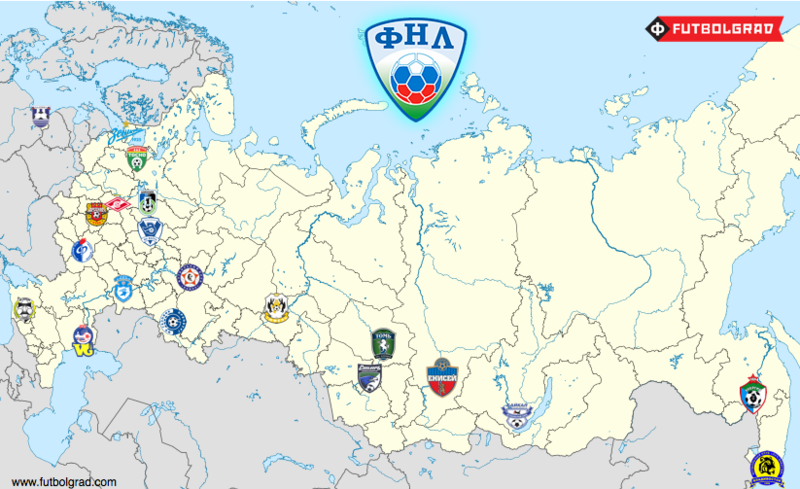 Looking into the crystal ball, there is every chance that in the coming years, an FNL East of twelve teams might also contain sides from towns as far west as Ekaterinburg, Perm and Orenburg, thus splitting the division almost 50/50 between Far East and the area around the Urals. The eagle-eyed reader might have spotted that there are no “2” teams in the Futbolgrad FNL—they are barred from entry. Though Zenit-2, Spartak-2 and Krasnodar-2 surely benefit their clubs’ respective first team squads by giving young players match practice, there are other ways that this could be done. With smaller leagues, there’s a danger that “2” teams could easily clog things up and make leagues uninteresting, given that they cannot be promoted to the Premier League (the twelve-team West division under the Gazzaev format could, for example, have three reserve teams competing in it). Futbolgrad would also favor having a fluid (within reason) number of sides competing in each regional league. 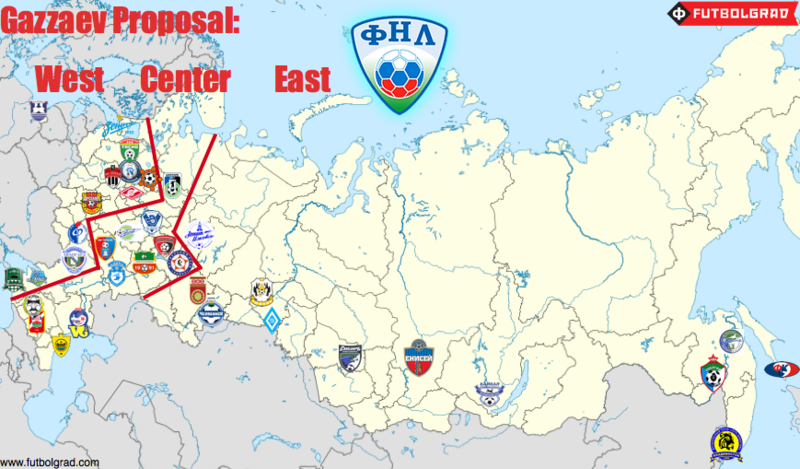 This would have an immediate impact on the East division, where league entry would be restricted only to clubs situated east of the Ural Mountains—as such there are just ten sides. More sides could apply to join the East of Urals FNL when ready, but even if this didn’t happen, fewer matches recognizes the longer recovery times players need because of the long away trips. The farthest journey now would be around 5000km from the Far East to Tyumen—not vastly different to how a Gazzaev league might look, but nevertheless 500km has been shaved off the longest away match. In the North Division, the greatest distance clubs would travel is around 2600km (Ufa to Kaliningrad), but this would likely only ever affect a few sides, as many are concentrated in a more central area; in FNL South, the distance between Penza and the most southerly clubs is around 1000km. 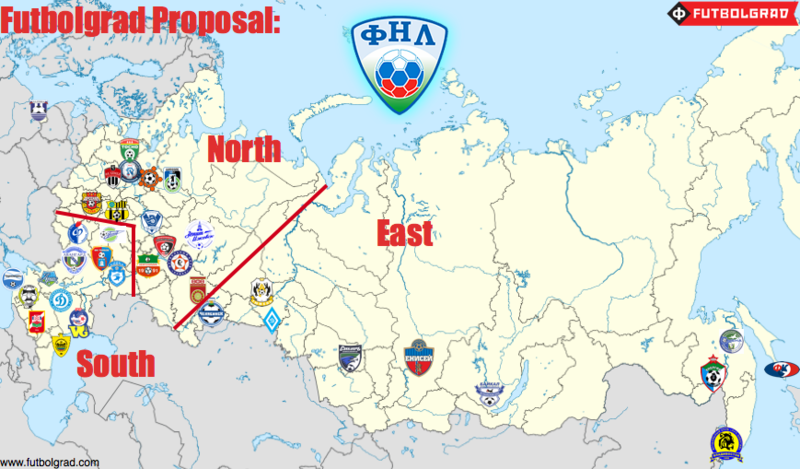 Under the Gazzaev proposal the distances would not be so different, but the Futbolgrad proposal means there is not the awkward issue of sides playing in a different division than their near neighbours, as the two densest football club areas—i) Moscow and approximately 400km around it, and ii) the area from Volgograd southwards—are the anchor regions for leagues rather than being forced to straddle league boundaries. Having fluid numbers of teams in the divisions means this would more than likely remain the case (as you can see, under the Futbolgrad format, there would be fourteen teams in FNL West to match more neatly the location of teams likely to be playing in it). In conclusion, it’s important to state that the Futbolgrad proposals are not superior to Gazzaev’s—he is an intelligent and passionate football man who knows what he is talking about. They are just another way another of solving the problem, and maybe have an advantage in that a North/South divide recognises some of the realities of Russia’s current football map. Ultimately, though, most fans of Russia’s second division (me included) would be grateful for any change that increased the regional intrigue and—more importantly—prevented clubs from dropping out of the league year after year. I like this plan, it’s interesting and well thought out.